California Indian dancers in traditional ribbon dresses dance to the CA bird singers playing traditional Indian gourd rattles in the background. This is a cool bright, Saturday May 2, 2009, morning next to the San Luis Rey River. Pala, the very word in the local language means water. 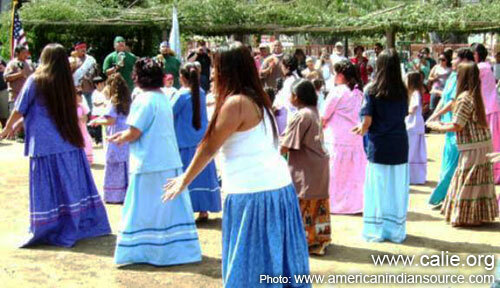 For over a hundred years, the Pala Luiseno Tribe has lived with the relocated Cupa group. Those past times have been ones of achievement, sorrow and inspiration. 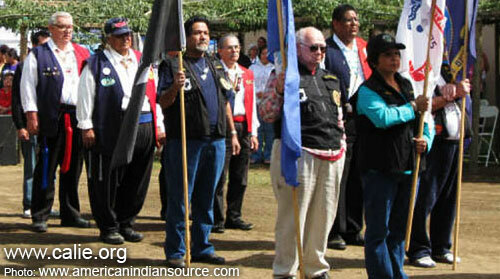 The Cupa Days festivities begin at 10am, the Pala Veterans’ Color Guard and the San Diego American Indian Warriors Association brings in the Colors. The Chiniki Lake singers from Fort Duchene, Utah sing the Flag, Honoring and Victory songs. Leroy Miranda is on the mike and filling in until Mike Renfil slides in as the Emcee for the event. Mike must have had 10 espressos on the way over. He is up and ready for the day! He describes the entertainment, dances and encourages the audience to participate in the cultural aspects of the presentations. Pala Vice Chairman, Leroy Miranda, who directs the tribe's Cupa Cultural Center, has done extensive research on the Cupa relocation. Miranda's great-grandmother, Rosinda Nolasquez, was the last Kuupangaxwichem survivor of the, May 12, 1903, Cupa expulsion. She died in 1987 at age 94 and is buried in the small Cupa cemetery at Warner Springs. There are significant references to this 35th Annual event and the inspirations of this respected elder that motivated this lasting Cupa Days legacy. This Cupa Days celebration, which has been held every year since 1974, is intended as a commemoration of the tragic removal of the Cupeño people from their ancestral village of Cupa in May 1903. In the spirit of cultural sharing, Cupa Days features traditional performances from a wide variety of native groups. This is a rich opportunity to hear and enjoy many highly regarded and emerging ‘Bird’ singing groups. The most popular song style in Southern California is the gourd rattle compliment of song cycle selections from the oral traditional treasures: Luiseno, Cupa, Cahuilla, Quechan, Seri and Cococpah Bird song groups presented selections. Additionally, are presentations from the Northern Plains, Championship Hoop dancers, Hopi Eagle dancers, and Yaqui Deer dance group. Southern plains horse and hoop dance and the ever-popular Orlone dance group. This has been a fine afternoon of jam – packed entertainment. The audience is just as varied. There are local folks to support their relatives and friends and regional visitors along with European and Asian visitors from overseas. Also observed are many elders with assisted mobility but eager to attend this very special opportunity. This year performances are entertaining, educational and remarkably exotic and varied. They are also well organized and constant throughout out the day and into the evening with the popular Peon gambling team competition. The Saturday and Sunday event also features arts and crafts vendors and food booths. Maybe we will see you at the next American Indian event. Mehan, Aho, Thank you. Back to Roy Cook's Articles page.